Come join members of the OQRA and play some tabletop games. Bring yourself, your friends, and your family. We'll have some classic board games and new games as well. If you have a favorite game bring it to play! This program is facilitated by the Old Quad Residents Association (http://www.oldquadsantaclara.org/). Registration appreciated, but not required. 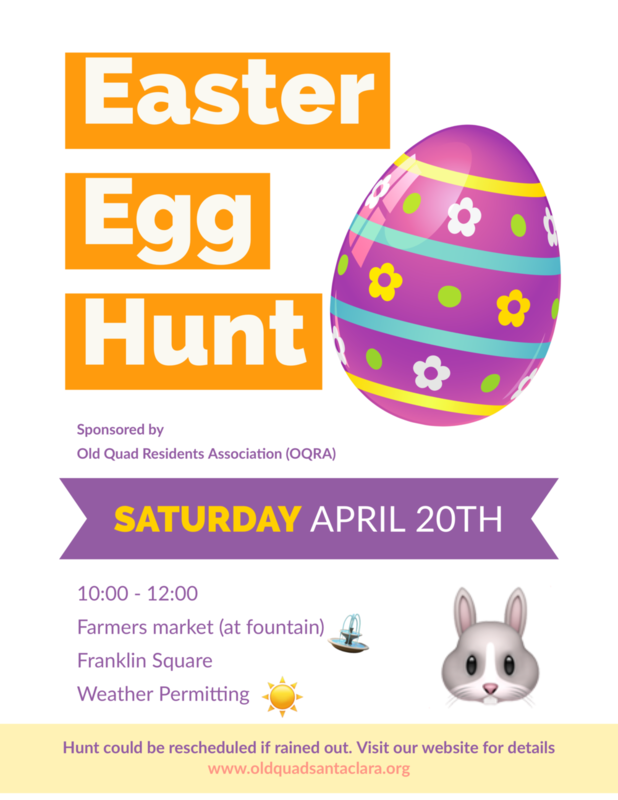 Join us in our annual Easter Egg Hunt at the Farmers Market! Join VTA and BART for a transit oriented development (TOD) workshop. The purpose of the TOD/Access Study, which focuses on the three future BART stations (Alum Rock/28th Street, Downtown San Jose, and Santa Clara), is to identify strategies to overcome barriers and constraints in existing plans, policies, and funding that inhibit TOD in Santa Clara County. The TOD/Access Study builds upon existing community plans, transportation and land use strategies, and provides analysis to inform future TOD policy adoption and implementation, including land use, development, and transportation mobility. The TOD/Access Study also complements the Diridon Station Area Plan update and the Diridon Integrated Station Concept Plan process being done in parallel. On April 16th through April 18th, VTA will be holding TOD/ Access Study Workshops. The purpose of these workshops is to share with the community the draft strategies that have been developed for each station area and to receive community input on these strategies. We invite you to join us for these workshops! Please share this information to anyone who might be interested in transit-oriented development in your station area and encourage them to attend the workshops, which take place immediately following the Community Working Group meetings. Spring City Wide Garage Sale. Find us in the Old Quad! The OQRA General Meeting will be held at Maywood Park on February 16th, 2019 at 9am. We will be in the Park building near the tennis courts. Introduction: The City of Santa Clara is holding a series of meetings for the Old Quad neighborhood to seek input on the development of a potential Old Quad Overlay within the City's Zoning Code. Date: November 29, 2018 Time: 6:30 - 8:30 p.m.
A PANEL DISCUSSION THE FUTURE OF SANTA CLARA’S EL CAMINO REAL Do you want to help SHAPE the City of Santa Clara’s VISION for the EL CAMINO REAL? Join the Santa Clara Community Advocates for an EDUCATIONAL DISCUSSION of the El Camino Real Specific Plan in Santa Clara. We will share ideas of how Santa Clara residents can GET INVOLVED in TRANSFORMING and REVITALIZING this important corridor. Hear local experts speak about TRANSPORTATION, HOUSING, and DESIGN, and discuss YOUR IDEAL VISION for the FUTURE of Santa Clara. 6:30 p.m. 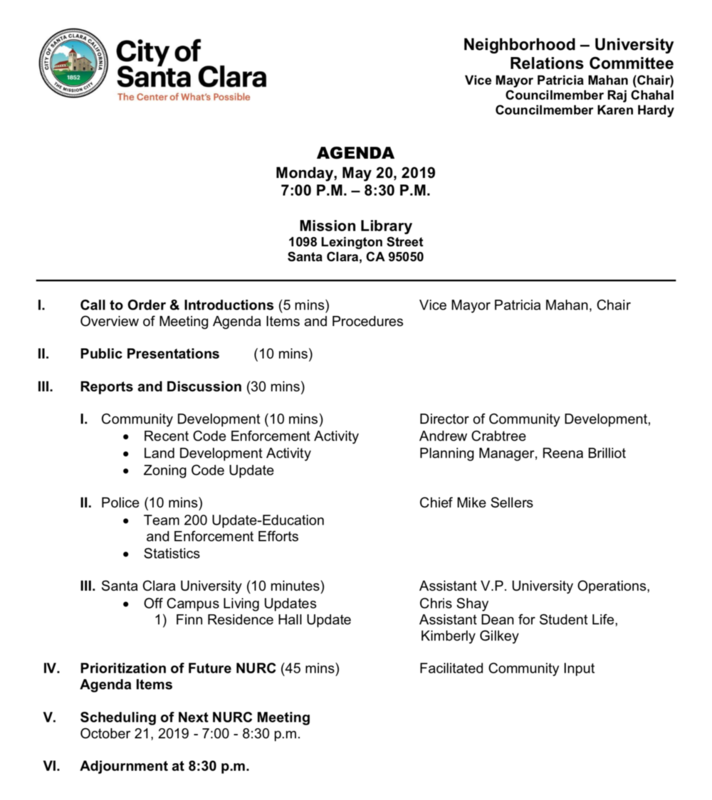 There will be a study session at the Planning Commission meeting on Wed Nov 28th to educate planning commissioners, planning staff and the public on issues and solutions to our parking problems in Santa Clara. The PC meetings are in the City Council Chambers. C.J. Gabbe is an urban planner and assistant professor in ESS. C.J.’s research focuses on issues connected to climate change mitigation and housing affordability. He is particularly interested in the political economy of urban land use regulations, and the effects of planning interventions on housing markets. Most of C.J.’s research is focused on the metropolitan areas of the western United States. He teaches courses related to sustainable urban planning, environmental policy, and geographic information systems (GIS). C.J. has a Ph.D. in Urban Planning from UCLA (2016), a Master of Urban Planning degree from the University of Washington (2006), and a bachelor’s degree in Planning, Public Policy, and Management from the University of Oregon (2001). Adina Levin is an experienced for-profit and civic entrepreneur. She is executive director and co-founder of Friends of Caltrain, a nonprofit with over 5,000 participants supporting sustainable transportation and land use in the Peninsula Corridor from San Francisco through San Jose. She serves on the Caltrain Citizens’ Advisory Committee, the San Mateo County Congestion Management Advisory Committee, the Menlo Park Transportation Commission, and the Menlo Park General Plan Citizens Advisory Committee. In the private sector, she co-founded and served as VP Products at Socialtext, a pioneering enterprise social software suite which was acquired by Peoplefluent. 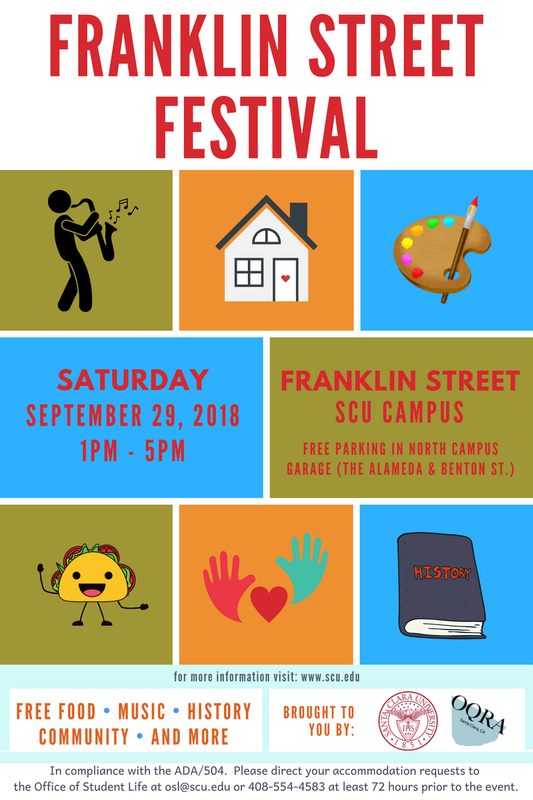 Santa Clara University (SCU) and the Old Quad Residents Association (OQRA) are sponsoring the Franklin Street Festival on September 29, 2018 from 1:00pm to 5:00pm on the newly renovated Franklin Street on the SCU campus. This event celebrates the renewal of Franklin Street between Alviso Street and The Alameda. 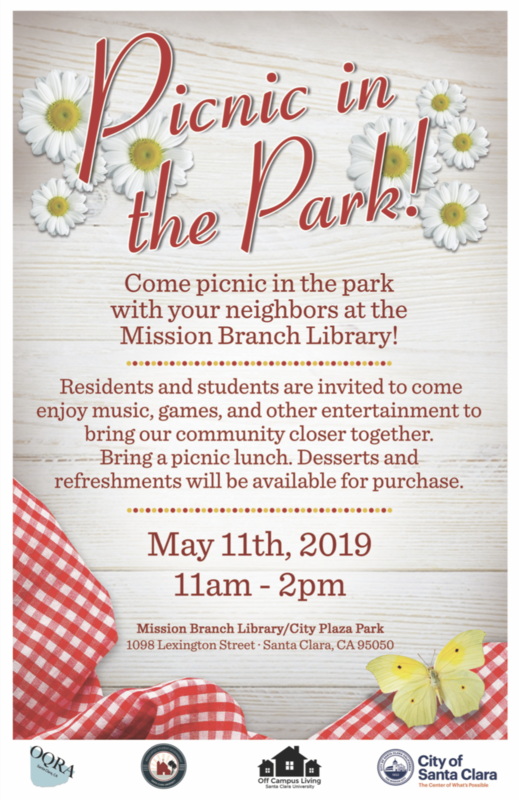 Rich with history, Franklin Street is a landmark to the Santa Clara community and all residents are invited to join in an afternoon of celebration. The day includes entertainment, displays of student and faculty artwork at the Edward M. Dowd Art and Art History Building, an opportunity to explore the historic Larder house, and an exposition of the historic and significant connections of Franklin Street. Food and refreshments will be available. Student and local community groups will be present to showcase their activities and offerings. Volunteer to help us at the Franklin Street Festival. We are in need of several volunteers to help us with visitors for the displays of student and faculty artwork at the Edward M. Dowd Art and Art History Building with visitors to explore the historic Larder house Volunteer shifts are 3 hours: Noon to 3:00 and 3:00 to 6:00. Complete this form to let us know you are available to help. Thank you! The Old Quad Residents Association, with support from the Mission City Credit Union, will be hosting a Candidate Forum for the Mayor and City Clerk positions ahead of the November 6th, 2018 election. We invite the public to submit questions to the candidates. The Old Quad Residents Association will include a selection of questions submitted at the Forum. The forum will be moderated by OQRA president, Adam Thompson. From noon to 5:15 PM. This year the Historic Preservation Society of Santa Clara is celebrating the 175th birthday of Captain Lass with a nautical and maritime-themed Family Fun Day! This is a free event with crafts and games for children including sponge painting, tying sailors knots, making sailor hats, face painting, a photo booth and a chance to pick a surprise from the treasure chest. Docents will be offering free house tours featuring a special exhibit on Captain Lass’s seafaring years and related artifacts in the house. 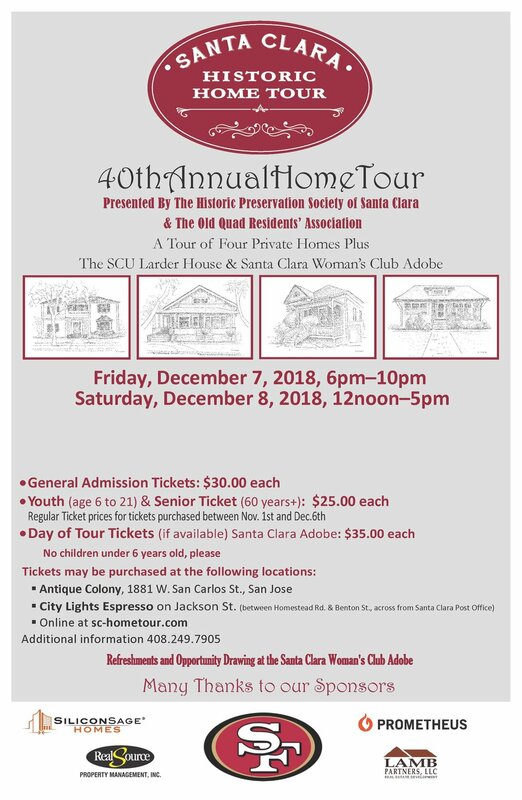 The historian from the South Bay Yacht Club and South Bay Historic Restoration Foundation will have information on Santa Clara County's maritime history, the Alviso Marina and the local Sea Scout program. Give Your Input on Levi's Stadium. 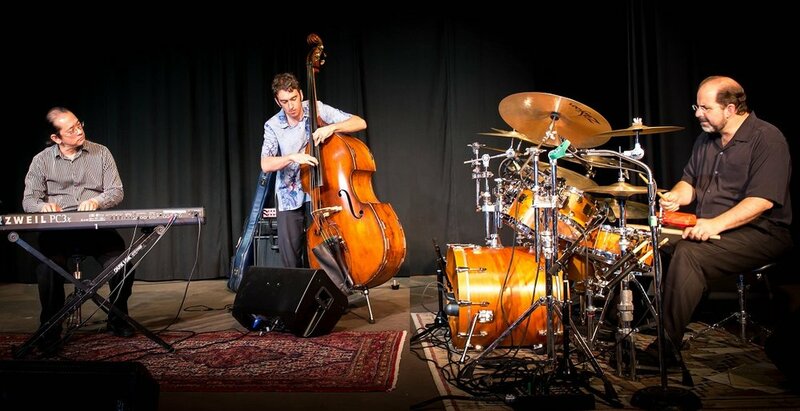 Space Available in Two Special Focus Groups! The City of Santa Clara and the Santa Clara Stadium Authority recently initiated a transparent, independent and comprehensive engagement process to hear the community's views on a variety of issues related to Levi's Stadium. The Public Dialogue Consortium (PDC) has been hired to coordinate community engagement efforts to ensure impartiality as we gather input from the community. Good News! There is space available in two focus groups that the PDC is conducting. Please consider participating in one of them. The purpose of these focus groups is to hear the full range of perspectives on Levi's Stadium. Any and all views on the Stadium are encouraged and welcomed, including yours! Input from the focus groups and other engagement activities will be included in a comprehensive report that will be presented to the Stadium Authority Board to assist them in making policy decisions related to the Stadium. Here are the focus group days and times. Additional information about the focus groups is included on the RSVP links. Group 1: Monday, March 19, 2018, 6:00-7:30 p.m.
Group 2: Wednesday, March 21, 2018, 6:00-7:30 p.m.
On October 17, 2017 the Santa Clara Stadium Authority voted unanimously to undertake a robust community outreach and engagement process related to identifying the community’s perspectives on issues such as noise, public safety, nuisances, parking, flyovers, crowd control, cleanliness, loitering, lighting, pyrotechnics/fireworks, performance curfew, and other items. We greatly appreciate the community’s interest in these issues and encourage the public to continue to visit this link for information about this project, the process, and how you can offer your input if desired. This Project’s objective is to implement a transparent, independent and comprehensive process to gather statistically valid public views on a variety of policy issues related to Levi’s Stadium, and to facilitate meaningful, robust qualitative input from stakeholders and the public on these issues. To gather as much meaningful input as possible, both quantitative and qualitative approaches will be utilized, including (quantitative) broad-based public opinion research polling and scientific focus groups, and (qualitative) one-on-one leadership and community interviews and organizational focus groups. These processes will touch hundreds of residents and stakeholders. The Authority is looking forward to further engaging the public on these issues, keeping the community informed, and collecting information that can form the basis for potential policy decisions moving forward if desired by the Board. Why hold a garage sale? Register online for individual, multi-family, or block garage sales. To search for Garage Sale locations, please refer to the map below. Create a master list with the items for sale and their prices. Post visible signs on private property only (no signs may be posted on utility or street sign poles). Have change and petty cash available. Have plenty of bags and boxes available. Donate usable items not sold. For more information, email us to Environment@santaclaraca.gov or call (408) 615-3080. The City of Santa Clara is looking to place a ballot measure on the June 5, 2018 Special Election, changing the way City Council members are elected, from by-seat elections to by-district elections. Here are some important things to know about this change. Community Input - Get Involved! 2) Which Draft Council District Map do you Prefer? Take the community survey here at Open City Hall. It is expected that the Council will consider the recommendations of the Ad-hoc committee at a public hearing during the Council meeting of May 8, 2018. On March 6, 2018 the Santa Clara City Council voted unanimously to place the Santa Clara District Election and Voting Method Measure, known as Measure A, on the June 5, 2018 ballot. The Santa Clara City Council placed Measure A on the ballot following its review of the Charter Review Committee’s unanimous recommendations on how to update the manner in which local elections are conducted, and approval of the City Attorney’s proposed ballot language. A district boundary map will be recommended in the coming weeks following public hearings held by the Ad-hoc Advisory Districting Committee. Candidates seeking election to the Santa Clara City Council are required to reside within the district they are running in and only voters residing in the district can vote on Candidates from the district. Establishes a voting process known as “ranked choice voting” for all city candidates for office. The single transferable method of ranked choice voting would be implemented by ordinance. The election by the most votes cast would continue to be used to determine the winner until the Registrar of Voters can implement the new voting method. Please continue to visit the Measure A website for updates and additional information. Click on the Event to get details like location and times. By attending any events, you give permission for OQRA to include your likeness in photos and videos, and to edit and publish them after the event.